With 10 double bedrooms and more than 10 bathrooms to accommodate up to 20 guests in luxurious comfort, the Chateau Ste Genevieve even has separate staff quarters. The Chateau Ste Genevieve is available year round and the location offers an unrivalled range of activities during all the seasons. 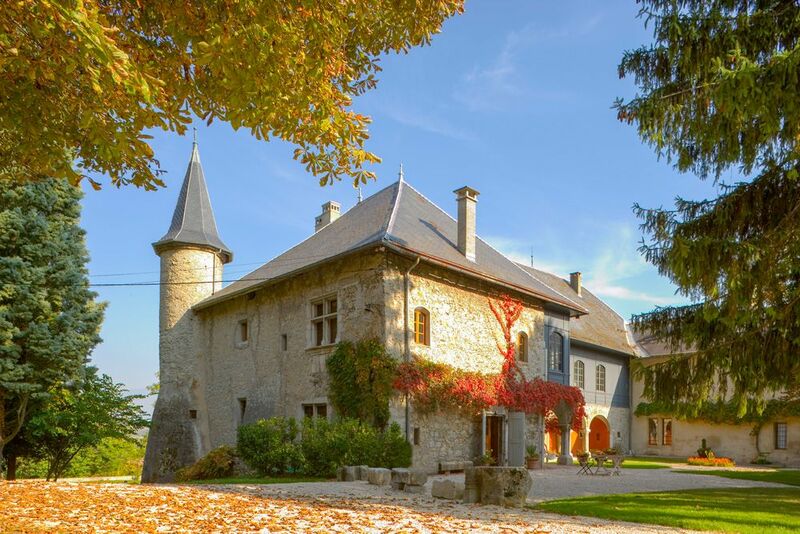 One of Europe's oldest renovated chateaux is available for your family holiday or reunion! The Chateau Ste Genevieve is located in the Savoie region of France at the base of the French Alps. Originally built by French monks as a priory in 1032-1033, the property was transformed into a chateau by Barron Charles-Albert Favier du Noyer in 1828. The Chateau Ste Genevieve changed hands three times before being bought and completely restored by the current owners, who have brought modern charm to the chateau while maintaining historical and architectural integrity. Cooking classes and wine tasting are available within the chateau. Contact Oliver's VIP Concierge using the blue box in the "Extras" tab for details. At Simply Chateau we only work with the very best rental properties on the market. All of our properties have been handpicked and we take our customer feedback extremely seriously. We operate a ‘three strikes and you�����re out’ policy - that is to say if we have 3 negative reviews relating to any of our properties we cease to advertise it. We have properties to suit every taste and budget, all chosen with care by our expert team for their unique character, fantastic features and stunning countryside locations. Free Concierge Service: As luxury rental specialists we have all the experience in the world helping each and every one of our customers find the most suitable property for their dream holiday. All you need to do is provide us with the details of what you imagine your dream holiday to be, and we'll find the perfect property for you. We can make sure that every arrangement is planned to perfection and each element of your holiday has been refined. Transfers, catering, maid service, tours and activities can all be prearranged to your specific requirements. 100% Financial Guarantee: We realize that financial protection is an important consideration when choosing a holiday company so to ensure you have complete peace of mind we are bonded members of ABTA. Lowest Price Guarantee: Simply Chateau ����simply’ processes the bookings and credit card payments on the property owner���s behalf. The owners themselves set the rates so you know you are getting the best available rental rate when you book. Avoid Internet Scams: Each and every property listed on our website has been checked to make sure that it actually exists. This ensures that you do not become a victim of an internet scam as can happen through an ordinary listing website. Amenities: - Internet. - Games room. - All rooms en-suite. - Ground floor bed/bath. - Skiing nearby. - Wedding venue. Both Geneva & Lyon international airports are 130km away. The nearest town is St. Jean de la Porte 2km away. The chateau is the ideal place to enjoy the typical French lifestyle and escape a hectic city life. With 3 local bakeries, a cheese shop and open-air markets that invite exploring you won�������������t go hungry! The nearby villages and towns have excellent shopping and dining opportunities. Children can entertain themselves in the huge private grounds. Albertville hosted the 1992 winter Olympics and is less than 17 Miles (27km) away. Chambéry, the former capital of the independent state of Savoie is 14 miles (22km) away. Water activities and sightseeing are available at Lakes Bourget and Annecy and are less than 28 miles (45km) from the chateau. The Savoie and Haute-Savoie are perfect for walks in the forest or lazing in the sun and there is something here for all tastes and ages. Guide Price: £10,338 - £12,405 (Low to high season price range based on exclusive hire of the property for a week). Short Breaks: £2,954 - £3,544 (Low to high season price range based on exclusive hire of the property for 2 nights). Security deposit: $3500 USD. This is paid on arrival and will be refunded in full after departure subject to damage inspection. Energy costs: Included in the rental price. End of stay cleaning: Please enquire.